After I'd covered my last metal eyelet with thread, I put on my stays and did a little photo shoot! The stays fit almost perfectly, just as the mockup did. I had a little trouble with the straps slipping, but that was most likely due to the oversized ribbon ties and me not tying them tight enough. 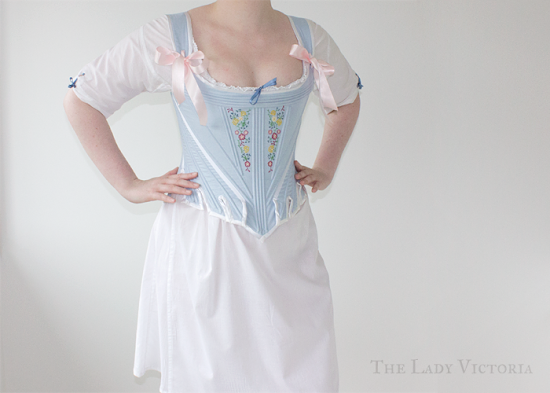 The neckline of my chemise is rounded, but threaded with a ribbon to gather it. This meant I could adjust the neckline to match the stays. I was pretty please with how the neckline and my decolletage looked. 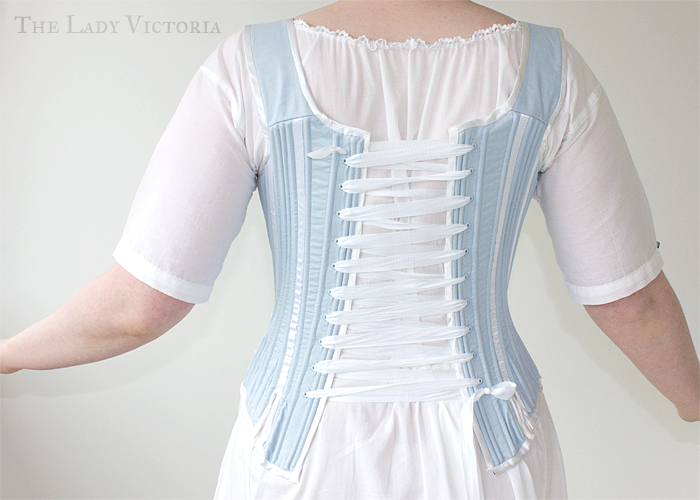 There was some wrinkling around the sides of the stays, but the front and back both sit nicely. The lacing on the back isn't parallel all the way down, unfortunately. I wore them again later on and still couldn't get the lacing quite parallel over my hips. It's not ideal, but it's not major. When I tried the stays on to fit the arm straps I accidentally broke a reed, and noticed it just in time to replace it before I completed the binding. I'm terrified of breaking another reed, but I could probably get a more conical shape with the tabs flared out more if I tried. Maybe after the stays have adjusted to my body I'll lace tighter. How historically accurate are they? The reed boning is a somewhat authentic, although whalebone would have been a better choice for a higher class pair of stays. 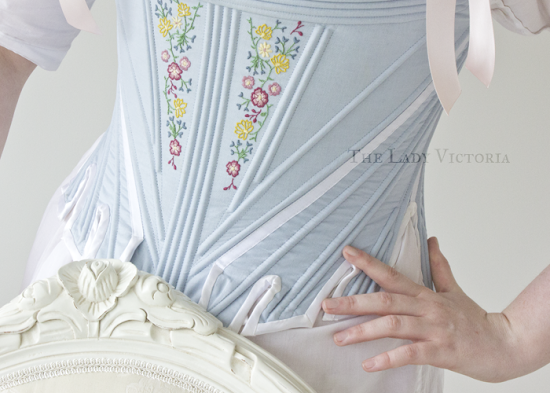 The pattern from Corsets and Crinolines is based on an extant garment. The fabric and thread would have been linen however, and there would have been no polyester. Also, the majority of the stitching was done by machine. I haven't yet found any existing stays with embroidery on them. The outer fabric is sometimes richly patterned silk, but no outright embroidery. 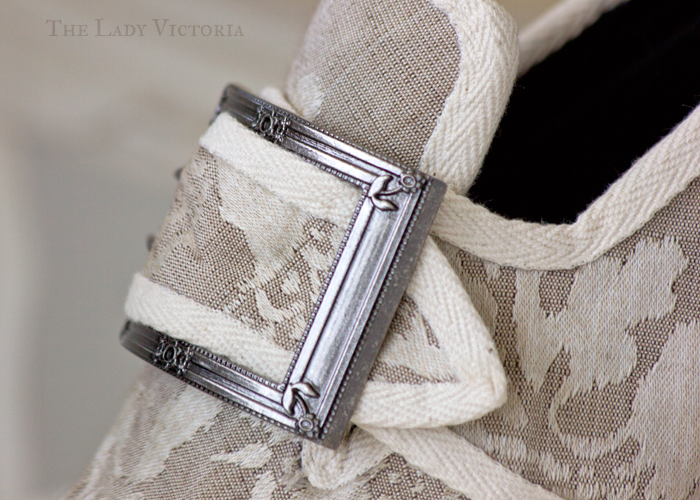 The metal eyelets are definitely not period, even if they are hidden! Maybe 50% accurate if I'm being really generous? I learnt so much making these, if I was to make another pair they would turn out radically different. Some parts were fun, particularly the embroidery and working with the reed, but I'm so glad they're finished.